Berlin (11 March 2015) — While Canada's Conservative government continues to reject the idea of a Financial Transactions Tax (FTT) evidence is growing that it is a proposal that could bring big benefits. Eleven governments in the European Union are working out final details of a regional financial transactions tax, with a January 2016 deadline for implementation. As part of this process, the German Social Democratic Party commissioned a study from the prestigious German Institute for Economic Research (known as DIW). 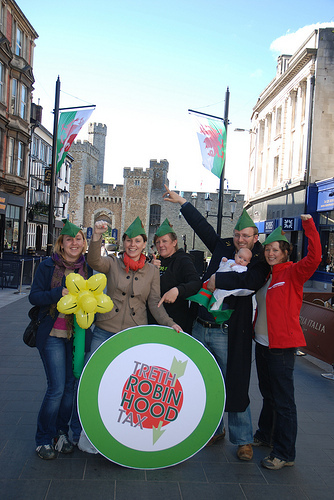 Advocates for a Robin Hood Tax have argued that applying a small tax to trade of stocks and derivatives would discourage short-term, speculative trading while generating significant revenue. The study released by DIW indicates that the money raised would exceed what has been previously projected. Sarah Anderson, from the Global Economy Project at the Institute for Policy Studies, notes that "Germany alone can expect anywhere from 18 to nearly 45 billion euros per year from a serious regional financial transactions tax, depending on how the tax affects trading levels, according to DIW. That translates into a potential benefit of about US$48 billion in an economy one-fifth the size of the United States." DIW estimates are based on the European Commission’s proposed rates of 0.1 percent on stock and bond trades and 0.01 percent on derivatives. The DIW also assumed that the 11 governments would adopt the European Commission’s anti-avoidance mechanism. DIW also examined three of the other participating countries and came up with revenue estimates of 14 to 36 billion euros for France, 3 to 6 billion for Italy, and 700 million to 1.5 billion for Austria. "For these four European countries combined, the total potential revenue estimate comes to considerably more than a previous European Commission projection of up to 31 billion euros for all 11 participating governments," said Anderson. "These impressive revenue numbers could shrivel, of course, if the European governments cave in to pressure from the financial industry. After several years of trying to kill the initiative altogether, European financial institutions have had to accept the inevitability of a financial transaction tax. Their focus now: pushing for exemptions that would render a new financial transactions tax virtually meaningless," explained Anderson. "In particular, the big banks would like to exclude from the tax all trades in derivatives, the potentially highly lucrative financial instruments that played a major role in the 2008 financial crisis." However, DIW notes that if derivatives are exempted, “most of the potential revenue from FTT is lost.” Indeed, Germany and France would lose approximately 90 percent of the expected revenues. This is partly due to expectations that traders would respond to the exemption by shifting into derivatives to circumvent the tax. Still, advocates point out that the case for a Financial Transactions Tax (or Robin Hood Tax) is becoming stronger.